I received this book for free from Publisher, Purchased in exchange for an honest review. This does not affect my opinion of the book or the content of my review. Why Did I Listen To Helen And Troy’s Epic Road Quest by A. Lee Martinez? 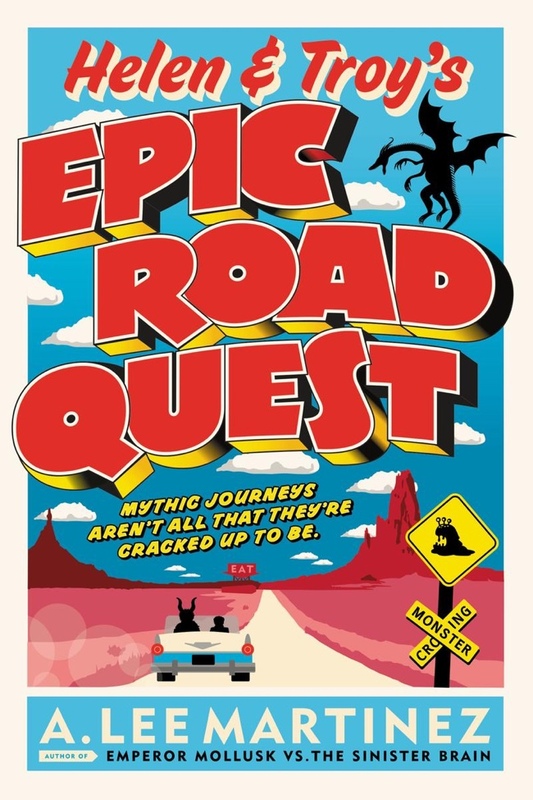 Helen And Troy’s Epic Road Quest by A. Lee Martinez is apparently a book I downloaded via Netgalley but that never made its way to my Kindle. Weird right? So then me being responsible and one of those I need to get reviews that I owe written sort of person, I checked my library for this book. As it turns out, they did not have it. When I bought this, I was in the process of figuring out what to spend my final Audible credits on. I grabbed this book based on the the idea that I would listen to it pretty quickly and then write my review. THAT DID NOT HAPPEN. This book just sat on my app for a long, long time. Finally, I ran out of Hoopla borrows for the month and was like HEY I SHOULD FINALLY LISTEN TO THIS BOOK. I need something funny! FYI, I can confirm, this book is funny. Helen And Troy’s Epic Road Quest by A. Lee Martinez is about two young adults named Helen and Troy (get it, get it). They both work at a fast food restaurant. Anyways one day one of their coworkers tries to sacrifice them to this god. Only, that backfires. Instead the two end up being issued a quest by the god. Through that quest the come across all sorts and it is a little like a odyssey. I mean, they meet a Cyclops, they meet the Fates who run a store. There’s orcs who are pursuing them. This book is what I think falls under the definition of madcap. Also, Helen is a minotaur. Troy is Asian American and also kind of perfect (this is something noted by the book). This adds an even more interesting dynamic to the book. How Did I Like Helen And Troy’s Epic Road Quest? Oh my goodness. You guys I listened to this book but now I feel a little silly. In my head I kept picturing Helen as a centaur and not actually as a minotaur and now my whole perception of the book has shifted. Or, at least of Helen. I was wondering how it would work between Helen and Troy with her having the body of a horse but as it turns out she looks more like Beast from Beauty and the Beast. Excuse me I am just going to be over here questioning life, the universe and everything. Okay but for serious, this is a funny book. I would say it’s a lot like Percy Jackson but for adults. On one level the writing reminds me of Christopher Moore which is quite the compliment. It has been a couple weeks since I listened to this book. However Helen And Troy’s Epic Road Quest is narrated by Khristine Hvam. It is nine hours and thirty four minutes long. I listened to it at double speed though as has been my habit lately. No complaints though. This is a really easy to listen to book. It’s not hard to follow. Hvam’s a superb narrator. I would recommend using an Audible credit on this book for sure. Me after realizing the difference between a minotaur and a centaur.